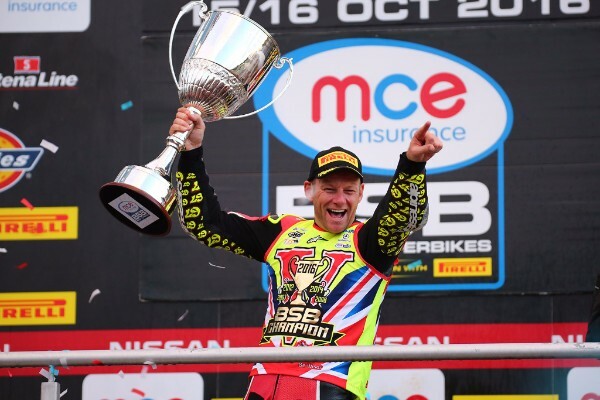 Reigning MCE British Superbike champion Shane ‘Shakey’ Byrne will be striving to add to his record-breaking title tally after signing a multi-year contract with the championship-winning PBM team for a further two seasons as he bids to claim a ‘magnificent seven’ titles. Byrne continues to set the benchmark as the most successful rider in the championship’s 20-year history, celebrating an incredible five titles, claiming 77 race victories and scoring a further 96 podium finishes. Byrne and team-owner Paul Bird have built a successful relationship over the past five seasons, claiming three championship crowns during that period. However, this landmark contract marks the first time that the two parties have cemented their continued partnership for more than just one additional season. The Kent ace was pushed all the way by his rivals this year on his way to title glory at the Brands Hatch season finale, in arguably one of his most challenging campaigns to date after the PBM team switched manufacturers to reunite with Ducati. Together with the Be Wiser Ducati team, ‘Shakey’ scored nine race wins and seven podium finishes with the first of his nine victories this year coming at Brands Hatch in May – the first ever win for the Panigale in the series. Byrne said: “I am so happy to have signed this new deal with Paul. The really strange thing for me is this is the first time that I have agreed a two year contract in BSB and I have a massive grin on my face! We have such a huge amount of mutual respect and we both know that we always give one hundred percent from both sides. “I’m personally feeling remarkably proud of everything we achieved, not only this year, but in all the years I’ve ridden for Paul. He’s played such a massive part in my success, and together we now have another shot at two titles, and who knows how many more. “It has been an amazing season; to take a brand new bike and turn it into a championship winner is a testament to all the hard work myself and the team put in during the season. Paul Bird, Team Owner: “It’s the first time we’ve offered a two-year deal to any of our riders in over 20 years so that is how significant we look at what Shakey and Ducati brings to the team. “To win the championship in our first year back with Ducati was a fantastic achievement for PBM, Shakey and the whole team, why would we want to change anything? He asked about a two-year deal, we were comfortable offering it so he’s happy and we are happy.